Definition: The ABC Inventory Control System is applied by those firms that have to maintain several types of inventories. Ideally, it is not desirable to keep the same degree of control over all the inventory types, since each vary in terms of its value of annual consumption. Thus, the ABC Inventory Control System is used to determine the importance of each item of the stock in terms of its value of annual consumption and are categorized as A, B, and C.
The items of high value are categorized as “A” and generally consists of 15%-25% of inventory items; that accounts for 60%-75% of annual usage value. The firm keeps strict control over these inventory items. 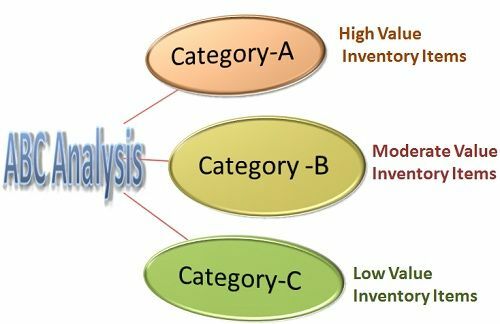 The Category “ B”, is comprised of those items that are of relatively less value or has moderate importance and consists of 20%-30% of inventory items, that accounts for 20%-30% of annual usage value. A reasonable control is kept on the “B” category inventory items. The least important items of the inventory are categorized as “C”. It consists of 40%-60% of inventory items; that accounts for 10%-15% of annual usage value. Due to a low value of these items, a simple or an ordinary control is kept on them.